To eliminate a human factor and to reduce the time costs during measurements, calibration of vibration-measuring transducers must be automated according to the methodological instructions (MI) 1873. The essence of automation is a software control of devices according to a specified algorithm replicating actions of a calibration operator. For this, connect generator and voltmeters to a computer through the RS-232 interface or USB. Hardware is operated via virtual devices. The control algorithm is implemented in SCADA (Supervisory Control and Data Acquisition) system. The SCADA systems allow creating flexible applications from complete functional units such as virtual measuring instruments, mathematical processing components, charts, and indicators etc. output of measurement results in graphical and numerical form. Calibration operator’s actions: specify basic values of frequency and vibration acceleration amplitude in accordance with sensor datasheet. γСУ– a conversion coefficient of a matching amplifier (γСУ=1, if the matching amplifier is not available). 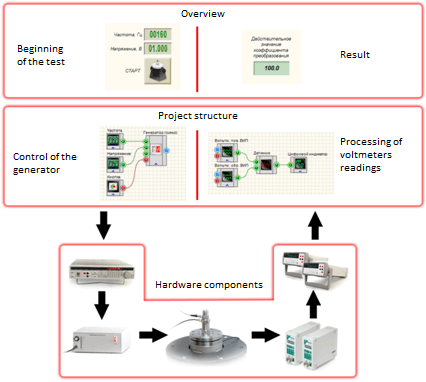 Examples of operating the “Calibrating of vibration transducers” project implemented in SCADA system ZETView are shown below. The valid conversion coefficient value is defined on the main page of the project. Parameters specified by operator (reference frequency and basic amplitude) are also used during measurements in the amplitude and frequency range. The “Current values” tab shows indications for channels of the reference sensor and sensor under calibration, as well as oscillograms of their signals. All the calculations are made automatically. Results are compared with tolerances, and calibration results are displayed on the screen: a valid conversion coefficient value and its deviation from the sensor’s datasheet value. Сalibration operator’s actions: specify the start value and end value of the vibration acceleration amplitude range and the number of measurement points, as well as the basic frequency value. Project operation: measurement range is divided into a specified number of points with creating an array of vibration acceleration amplitude values. During the measuring process, all the vibration acceleration amplitude values are reproduced sequentially at basic frequency and voltmeters indications are recorded. At the same time, a graph of dependence of the conversion coefficient on vibration acceleration amplitude is created. After the measuring, the results are processed. where n is the number of measurement cycles. Examples of operating the “Calibrating of vibration transducers” project implemented in SCADA system ZETView are shown below. The “К(а)” tab defines the test parameters and shows the graphs of the dependence of conversion ratio of the calibrated sensor on vibration acceleration amplitude (during measurements) and conversion coefficient deviation from vibration acceleration amplitude (after completion of measurements). 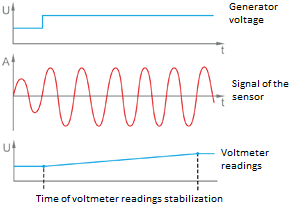 The “Current values” tab shows the indications for channels of the reference sensor and sensor under calibration, as well as the oscillograms of their signals. All the calculations are made automatically. The results are compared with tolerances, and the calibration results are displayed on the screen in graphical, numerical and indicator view. Operator`s actions: specify the start and end value of the frequency range, the basic vibration acceleration amplitude value in accordance with the datasheet for the sensor, as well as the vibration relocation value limit at low frequencies in accordance with characteristics of the vibration board. Project operation: During measurements, depending on frequency the vibration acceleration amplitude value is specified and fluctuations with specified parameters are reproduced. The voltmeters indications are recorded for each frequency. At the same time, a graph of dependence of the conversion ratio on vibration acceleration amplitude is created. After the measuring, the results are processed. S – vibration relocation, mm. Cb – conversion coefficient of the calibrated vibration transducer, which is defined at basic frequency, mV/ms-2. Examples of operating the “Calibrating of vibration transducers” project implemented in SCADA system ZETView are shown below. The “К(f)” tab defines the test parameters and shows the graphs of the dependence of the conversion coefficient of the sensor under calibration on frequency (during measurements) and the conversion coefficient deviation from frequency (after completion of measurements). The “Current values” tab shows the indications for channels of the reference sensor and calibrated sensor, as well as the oscillograms of their signals. All the calculations are made automatically. The results are compared with tolerances and calibration results are displayed on the screen in graphical, numerical and indicator view. U0 – initial voltage of the generator, V.
In attempt to reduce the calibration time and measurement optimization time, the project development usually requires automatic selection data storage time, in which case, two factors are taken into consideration: data averaging interval by voltmeters and the delay before voltmeters indications recording. The data averaging interval by voltmeters must cover at least 5 signal periods to ensure the convergence of indications and reduce interference on the indications. The graphs in the figures below show dependence of the voltmeter indications on averaging time equal to two signal periods (a) and ten signal periods (b). Timeout before recording o voltmeters indications must exceed data averaging interval by voltmeters in order to make sure that the recorded value and data collected by voltmeters before change of frequency/amplitude is not affected by transient processes. 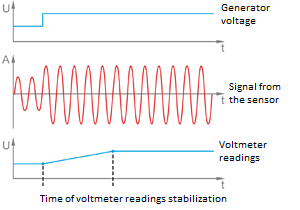 Voltmeter response time depends on signal frequency (see figures below). Recording of voltmeter indications to determine the conversion coefficient of a calibrated sensor. The mathematical component of SCADA systems is used to process measurements results strictly in accordance with the MI 1873 methodological instructions. The obtained parameter values are compared with tolerances and a sensor suitability conclusion is made. Signals from the reference sensor and calibrated sensor are sent to AC voltmeters. The voltmeters indications are divided, and the obtained conversion coefficient of the calibrated sensor is sent to the K(F) array. During the measurements, the array of the conversion coefficient with all values from the selected frequency range is formed. Index of reference frequency of the selected range is determined by deducting the initial frequency index from the basic frequency index. Based on the К(F) value array and reference frequency index, an array of the conversion coefficient deviations from the value at reference frequency is determined by consecutive operations “Calculation of constant”, “Division by constant”, “Multiplication by constant”. This array is displayed on a graph, and the module maximum value of an array element which is displayed by the digital indicator and compared to tolerance is determined. The result of comparison is shown on the indicator figure. One more advantage of SCADA application is a possibility to save test reports by one click. The report files are generated based on user template, i.e. the measurement results can be recorded into the company’s form. A template of test report is attached to the “Calibrating vibration transducers” project. This template can be changed according to requirements of a company which uses the project or has ordered the vibration sensors calibration. Sample report template and a test report sample created with this template are shown below (click on the image to zoom).